1 What is H1N1 Swine Flu? 2 How swine flu spreads? 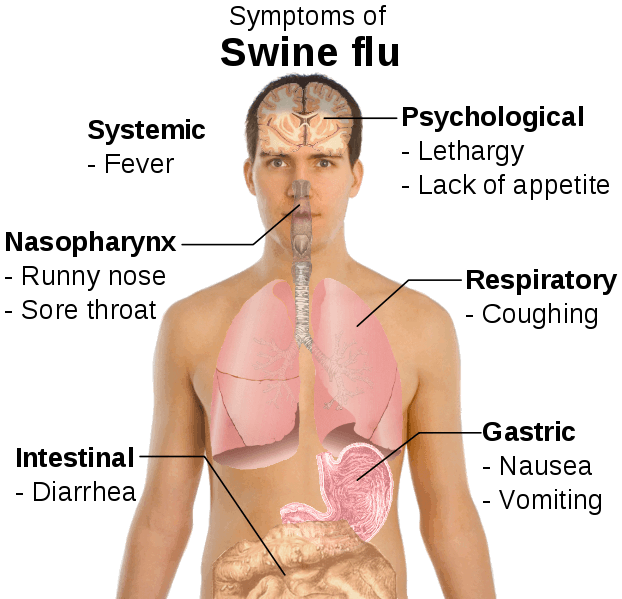 5 How is swine flu diagnosed or what are tests for detecting swine flu? What is H1N1 Swine Flu? Swine Flu is basically disease of pigs. Influenza virus among the animals is the reason of the flu in pigs. Interesting part is swine flu is not spread from pigs to humans, but from humans to humans. Swine flu is one among the very contagious diseases. Presently, it has taken a form of an epidemic. It is seen across 74 countries. Swine flu is also known as H1N1 virus. So now, you are clear on what is swine flu H1N1? Swine flu is highly contagious and spreads from a single sneeze. A sneeze and thousands of viruses are spread in air. It spreads more in those areas, where people gathering is in more proportion, such as fair, gatherings, events. Mucus and saliva can carry it further. If the infected swine flu viruses are on door knobs, railings, floors or benches and you have a hand contact with and you happen to bring that infected hand near your nose or mouth, you are most likely to get infected with H1N1. These are causes of Swine Flu. Cough and cold is very basic sign of Swine Flu with high fever. Other symptoms and signs of Swine Flu are headache, pain in throat, fatigue, body and ankle aches, and vomiting. In case, if you feel any of these symptoms, best practice is to visit the doctor and get the reports for the Swine Flu. The most prominent way is prevention is better than cure. It spreads through sneezing and cough and cold, so avoid going at public places with too many people around such as theaters, fairs and social gatherings. Living in India is all about being formal and meeting a hospitalized person is a must, but avoid this time as Swine Flu is highly contagious. Hand wash and sanitization is the best practice to avoid swine flu. Regular hand wash, avoid hand shakes, Namaste is the best practice, avoid placing your hands your face and mouth. Have good food, work outs, boost immune system, stay hydrated by consuming 8 to 10 glass of water daily or more. Enjoy enough sleep. Wear a face mask that is specially prepared to avoid H1N1 virus. But don’t make a practice to use your hands under the mask. How is swine flu diagnosed or what are tests for detecting swine flu? Swine flu test is done by taking a swab of mucus from nose or throat. All hospitals are not equipped with swine flu tests and treatments, so inquire about the hospital, where it is being treated to avoid more people getting infected by it, as a social responsibility. Analysis of swab is done by genetic and laboratory techniques. At an early stage swine flu can be completely treated and the patient has to be completely isolated. Antibiotics are not going to help as this is a viral infection and not bacterial, so better reach a doctor first. Here anti viral drugs will be helpful. Tamiflu is the most known medicine for swine flu treatment. The generic specification for it is Oseltamivir and the other one is Relenza or Zanamivir. These drugs should be taken only under the medical supervision and no treatments at home. This is not the disease, which can be treated at home like a headache, so getting information from net purchasing medicine and implementing the experiment on self is not at all suggestible. Swine Flu vaccines are available in the markets and 6 companies are manufacturing it. Though they are 60% effective and need to work and determine side effects are there or not. In any case, running blindly to medicine shops or pharmaceutical is not advisable.